The below Notice of Intent was issued yesterday to one of the five "fraudulent conveyees" in what is arguably the "worst bank foreclosure fraud in U.S. history", and representing one of the MANY elements comprising the MorganStanleyGate scandal. Moreover, this is also being concurrently shared with the U.S. Justice Dept., the Obama Administration, numerous activist groups, select law enforcement, and contacts at over 1,800 news media organizations. This segment of the FIVE-PART bank foreclosure fraud of MorganStanleyGate entailed an elaborately orchestrated grand larceny theft of a two-bedroom residential condominium in the Meadowmont community of Chapel Hill, North Carolina. The pre-eviction "crime scene" is reflected in the below pictures, which include its innocent victims -- to wit, Spencer C. Young, his fiancee' (Leah Krier) and son Jackson (age two at the time), who were rendered homeless on a cold rainy day in February 2010. This bank foreclosure fraud was surreptitiously sponsored by Morgan Stanley, and was principally executed by Wachovia Bank and Paragon Commercial Bank, financial institutions which have long had close ties, particularly at the senior executive level. In fact, at the time these foreclosure frauds were executed in earnest, the respective CEOs were local born, raised and educated North Carolinians. This triad of wayward bank CEOs are also part of a secretive amorphous group of tyrannical bankers, whom some refer to (with part-reverence and part-trepidation) as "the Mack Mafia". Their names are John Mack, Bob Steel and Bob Hatley. (click here for more, and read the section titled "Morgan Stanley"). Now it should be pointed out that relative to the polished, shrewd and savvy Messrs. Mack and Steel, Bob Hatley is especially unimpressive and reminiscent of the dumb kid on the block who could be talked into doing just about anything . . . and in this case he did. In fact, Mr. Hatley hired a loan workout specialist from First South Bancorp named James Hoose, who, because of his lack of ethics, heartless demeanor and physical stature was referred to by others as an "homunculus thug". 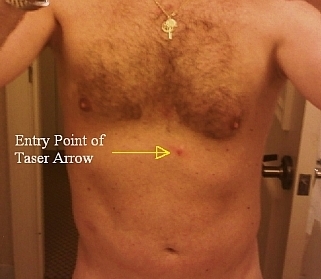 In this entirely baseless and unlawful eviction, Mr. Young was tortured by being electrocuted with 50,000 volts of electricity through an entirely unnecessary tasering, in which the taser arrow was shot directly at his heart (seemingly an attempt to cause "asystole"). He was then arrested on fabricated charges (which were later dropped because they were recognized as bogus), held in custody against his will, denied access to an attorney, and incessantly threatened with incarceration if he continued to exercise his Constitutional right to remain silent. Although handcuffed behind his back, the cuffs intentionally constricted to the point of eliciting chronic physical pain, Mr. Young was taunted over many hours to instigate Mr. Young to do or say something during a unjustified four-hour interrogation that would justify incarcerating him, he nonetheless remained calm, and reiterated his request for legal representation. This constitutional right granted to ALL U.S. citizens was denied. He was then committed to a mental ward against his will, and predicated on an entirely concocted basis, as depicted in the movie, Changling, starring Angelina Jolie. He was further threatened under extreme duress to sign papers against his will, the content and nature of which, he was completely unaware. As a result of Paragon's foreclosure fraud on the Meadowmont Village Condo, Leah Krier suffered a nervous breakdown, and still continues to suffer from its effects, while Mr. Young has not since Jackson since that time. The below video further reflects the impact of this dastardly deed. This particular transgression is one in a five-part sequence of bank foreclosure frauds directed at Mr. Young on relatively under-leveraged properties with an aggregate post-redevelopment value of $22 million. Implicated in what are a dizzying array of misdeeds are MANY senior bankers, prominent attorneys and government officials, which were prefaced and made possible by an overwhelming smear campaign entailing over 60 patently false and disparaging articles which appeared over a 15 month period in four local newspapers. (Click here to access a cogent analysis of these profoundly obvious prevarications, which now lay bare the potentially massive libel claims against the respective newspapers and staff reporters who mocked the notion of journalistic integrity.) When the multi-faceted bank foreclosure fraud was directed at this property, it was so brazenly unlawful that NOT a single article was written about it . . . for fear public attention would expose it. (Click here for the details on the 20 separate elements of fraud employed by Paragon Commercial Bank). The criminal investigation Mr. Young is calling for will explicitly reveal how this particular foreclosure fraud is DIRECTLY linked to the stifling greed and overwhelming corruption that has long oppressed "the 99 Percent" represented by the nascent, but already powerful Occupy Wall Street movement. Moreover, this fraud represents just one of the MANY weak links in "The Long Chain of Fraud & Corruption of MorganStanleyGate". While such a nightmare is difficult to fathom, this is "only the tip of the iceberg", because bank foreclosure fraud goes on all the time -- however, in this case, the value of the assets is relatively large, and target of this wrath is a former Wall Street insider and long-time banking executive at Citicorp, JPMorgan and Morgan Stanley, who can recite chapter and verse on how the banks have gotten away with this for so long. Importantly, once the publicly transparent investigations begin, it is predicted the associated corrupt banking house of cards will come tumbling down, and countless others will thus benefit. The corroborating evidence of fraud and corruption is significant, damning and irrefutable, and access to the tens of thousands of pages of documents (many of which were produced by Morgan Stanley, Wachovia and Paragon) is readily available and posted on-line at over a dozen of Mr. Young's web sites -- click here for a listing of just SOME of those websites. As you know, the Occupy Wall Street (“Occupy”, or “OWS”) movement is a clarion call against unbridled greed and rampant corruption, which manifested an illegitimate chasm between the “haves” and “have-nots”. It is also represents a reclamation of rights, as our forefathers intended. OWS is destined to become the most seminal global social movement in the history of mankind. Do the math: What’s 99% of seven billion? I preface in this manner because the circumstances surrounding the above referenced Property is representative of what instigated this powerful grassroots movement. However, to understand how this is the case, I must indulge you with a précis of my background, two empirically valid premises, and a logically deduced conclusion. For reasons outlined herein, this shall serve as a NON-ADVERSARIAL notice of intent to exercise rights to reclaim possession of this Property on behalf of its rightful owner. Notwithstanding, I will be assiduous in my pursuit to correct this and related wrongdoings that evidenced a malicious assault on inalienable, civil and constitutional rights, the U.S. judicial system and established American values. Importantly, the OWS movement is all about confronting and correcting a woefully oppressive status quo. At Morgan Stanley, I built its commercial mortgage-backed securities (“CMBS”) conduit business (entailing lending and securitization) into a market leader and created the highly successful IQ® (“Institutional Quality”) franchise. Prior thereto, I founded the CMBS business at JPMorgan, serving as Chief Operating Officer for its commercial mortgage finance and securitization business. The intrinsic shareholder value thus created by these franchises at each of these “Houses of Morgan” exceeded $1 billion. Over my career, I was directly involved in, or otherwise responsible for over $30 billion in transactions, while more on my background can be accessed at SCYInv.com. Now for the particulars – and recognize that these premises are what I know to be absolutely true, based extensive first –hand knowledge as a former Wall St. insider / investment banker, as well as the ensuing target of unrelenting avarice-driven wrath. What began as a relatively pedestrian employment fraud by colleagues at Morgan Stanley eventually transmogrified into a scandal of now epic proportion, and due to its parallels with that of the Watergate scandal, it has been aptly coined MorganStanleyGate (TWSYF.com provides a cogent overview). But how can a seemingly parochial matter be linked with this massive, evolving and continually growing Occupy movement? Answer: Those who instigated MorganStanleyGate (its beginnings are explained at MEVEP.com) were ALSO responsible for Morgan Stanley’s entrance into the toxic sub-prime residential mortgage business. Their names are Tony Tufariello, John Westerfield and Warren Friend – and each has since been fired. But how is this relevant? To use now popular OWS vernacular, this nefarious trio of reckless “One-Percenters” were driven by unbridled greed to take on risks they hardly understood, eventually leading to ASTRONOMICAL losses that brought Morgan Stanley to its knees, ended its days as an investment bank, and necessitated a $10 BILLION Congressional bail out with taxpayer money (and countless other billions of “printed money” from the Fed) to stave off Morgan Stanley’s otherwise certain demise. Ergo, those who instigated the MorganStanleyGate scandal also played instrumental roles in wrecking OUR economy, and in oppressing the “99-Percenters” who comprise the OWS movement – hence proving the veracity of this first premise. And how is MorganStanleyGate germane to this condominium? This Property was stolen through elaborate and unlawful orchestration in North Carolina, and ALL surreptitiously sponsored by Morgan Stanley. These misdeeds were principally carried out by Wachovia Bank (“Wachovia”) in collaboration with Paragon Commercial Bank (“Paragon”). To understand how these banks are linked, click here and read the “Morgan Stanley” section of this blog entry. The unimaginable transgressions directed against me (and my loved ones) have spanned NINE YEARS and were acts of retaliation intended to stop me from pursuing justice and deprive me of resources to collect on these mounting civil claims. And by publicly assassinating my personal character and professional reputation with a combination of malicious sabotage and bold-faced lies (by mouth and in print), the underlying civil and criminal wrongdoings of MorganStanleyGate would in “Churchillese”, forever remain a secret wrapped in an enigma, shrouded by mystery. Notwithstanding, I will NOT allow this entirely fraud-induced indignation to persist, which for a variety of reasons is also the overwhelming sentiment felt by those who support the Occupy movement – simply put, the status quo of corruption-based oppression is UNACCEPTABLE. Conclusion: Deductive reasoning leads to concluding the subject Chapel Hill condominium is very much linked to The Occupy Movement. The subject Property was seized via an audacious ILLEGAL foreclosure fraud perpetrated by Paragon Commercial Bank, and neither this bank, nor any of its subsidiaries held legitimate ownership title in which to convey. This means you do NOT own this Property. Accordingly, it is my intent to exercise rights to reclaim possession of this Property on behalf of its rightful owner, which is a closely held corporation. With this communique, I am presuming you have been an unwitting party in this fraud, and in the spirit of cooperation, please know I intend to pursue this in a reasonable and cooperative manner that will also serve to best mitigate your damages. In other words, if you work with me, I will see to it you are made whole, and I will go out of my way to ensure any associated inconvenience to you is kept to a minimum. As this relates to a criminal matter of national significance, this transmittal must also be widely disseminated. For example, it is being concurrently shared with approximately 1,800 news media organizations, as well as relevant government and regulatory officials, numerous activist groups – even President Obama and related staff. You can also monitor activities at my various websites -- in fact, THIS letter can be accessed at MorganStanleyGate.com by clicking on “James & Katherine Pope” on the side bar. In closing, please know that the purpose of this letter is to advise you of this fraud and to put you on notice about my good faith intentions to reclaim this Property in a manner designed to also mitigate YOUR damages. Spencer C. Young, Individually, and as President of Spencer C. Young Investments, Inc.